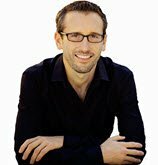 It’s a step-by step guide revealing essential conversion rate optimization techniques, tools, best practices, A/B test ideas and strategies needed to effectively improve the conversion rate of any kind of website and the revenue generated from it. 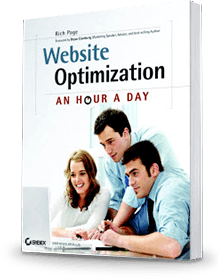 Even though it came out in 2012, the techniques and strategies in it remain highly relevant and effective, and are commonly used by leading conversion rate optimization experts. Buy at Amazon.com Get Two Chapters Free! 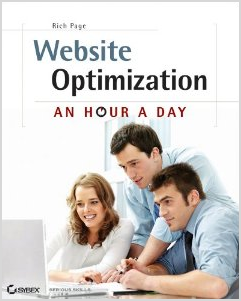 It’s currently rated 4.4 out 5 stars on Amazon.com and is part of a great series of online marketing books called ‘An Hour Day’, including the highly rated ‘Web Analytics: An Hour a Day’ by Avinash Kaushik. From optimizing calls-to-action and headlines to using advanced personalization and targeting techniques, it takes a unique approach by using best practices from web analytics, web usability and online marketing to help you get the most out of your optimization efforts. Pretty much anyone that is involved with creating and marketing websites and wants to increase their conversion rates and make more money from their website – whether its for a small business website, or a Fortune 500 online business. It’s great for beginners, but also contains some great advanced best practices and A/B test ideas for seasoned online marketers to learn from. 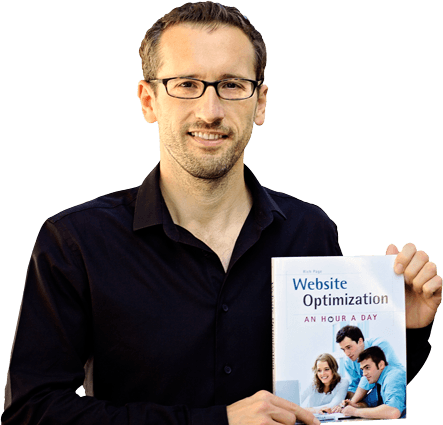 I’m honored to hear that people are loving this book, particularly some of the conversion rate optimization and analytics experts out there! Fill in this form to get this content instantly.